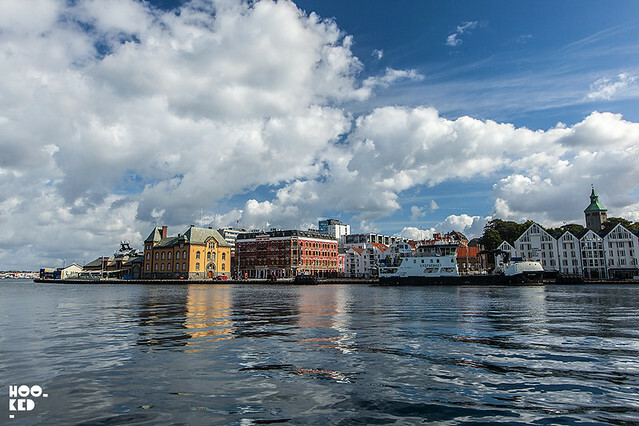 We love traveling here at Hookedblog and do so as often as the bank balance will allow. We have always enjoyed exploring new places and experiencing new things. But as much as we enjoy the new we do on occasion love to return to places we’ve visited in the past especially if there is a street art or mural festival happening while we are also visiting a city all the better. 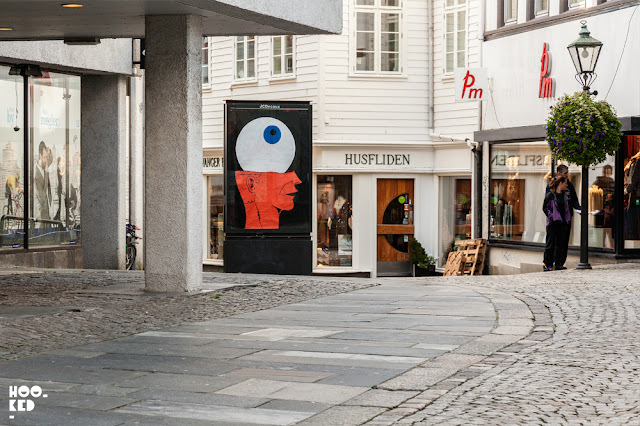 For us it's always fun to catch up with the street artists and friend who might also happen to be in town as well as meet and make new contacts, such was the case at this years Nuart Festival in Stavanger, Norway (Previously on Hookedblog) on our second visit to the city. Meeting some of the talented people we follow or know only online and putting faces to the people behind the Street Art websites and social media accounts was an added bonus. It was also cool to meet up with artists whose work we have been following for some time but have not crossed paths yet and one such artist we got introduced to in Stavanger this year was American artist NDA. 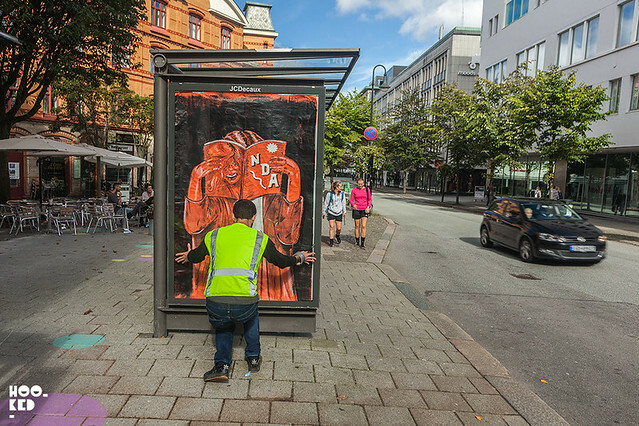 NDA is contemporary muralist living and working out of Philadelphia, PA, who had traveled to Norway from the US to assist Norwegian based artist Nipper who was running art based workshops with teenage kids. 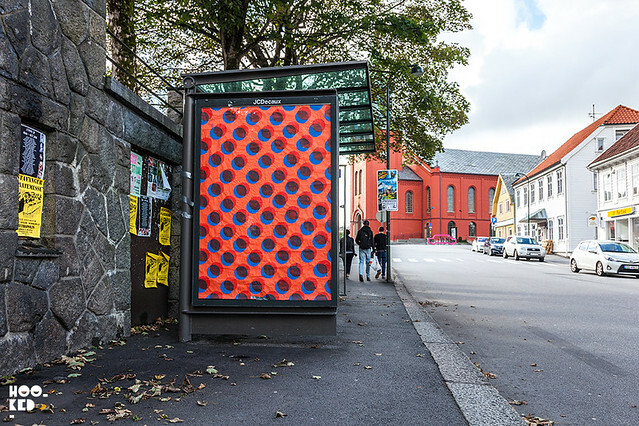 Once the series of workshops were complete NDA stopped in on Stavanger to check out this year's festival with plans to install some works on the street. After a series of WhatsApp messages we eventually caught up with NDA as he was hitting the streets of Stavanger. 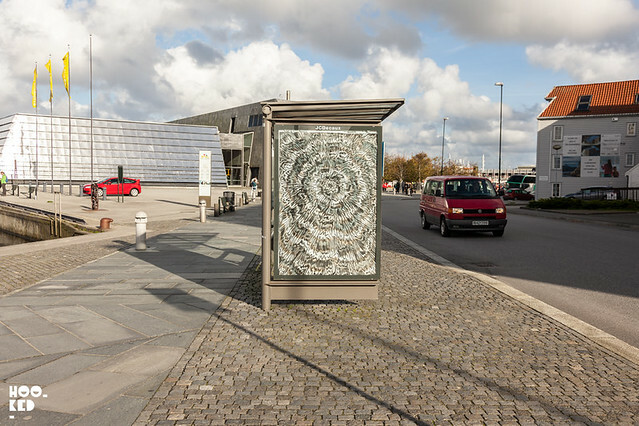 NDA had with him a collection of large scale hand painted posters and the key for the city, a key that allowed him access to the advertising light boxes right across Stavanger. 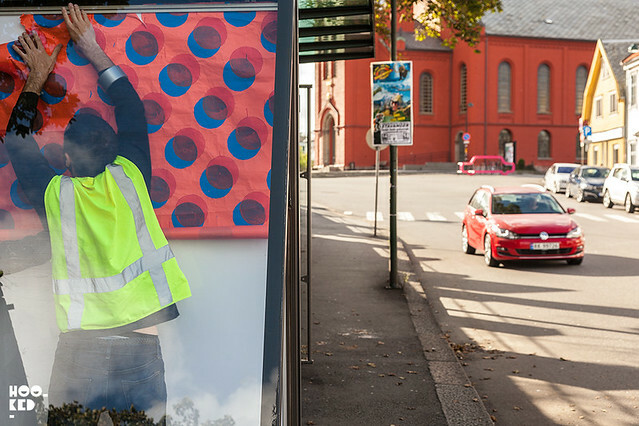 With some locations already scouted out, NDA donned his high visibility vest and set about opening various light boxes, removing the commercial advertising posters and replacing them with his hand painted works created to match the ad shell sizes. 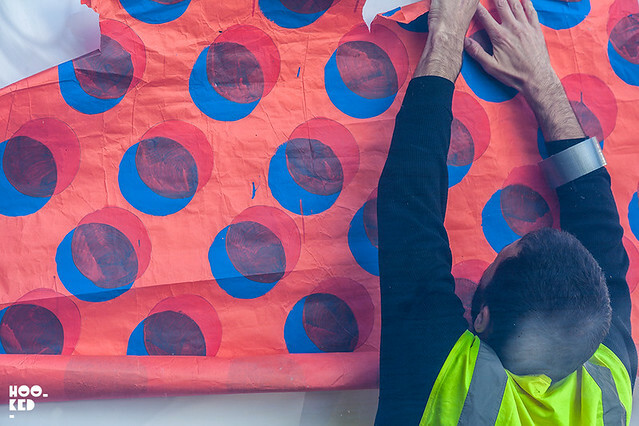 We accompanied the artist for the afternoon capturing him at work installing multiple works at a number of key city locations and have shared a selection of images we photographed over the course of the afternoon here. 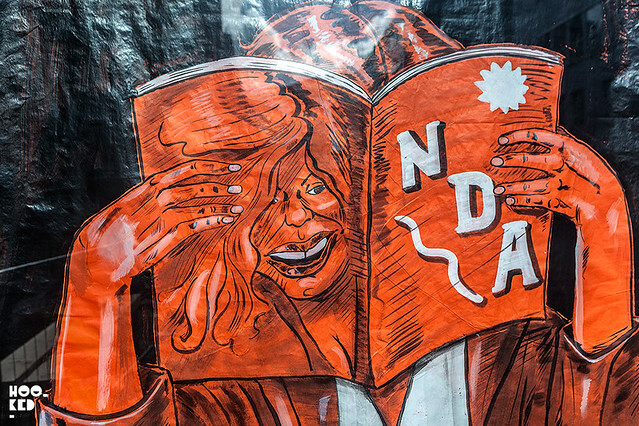 Close up shot of one of the installed NDA artworks. Securing the poster into position having swapped out the commercial poster. 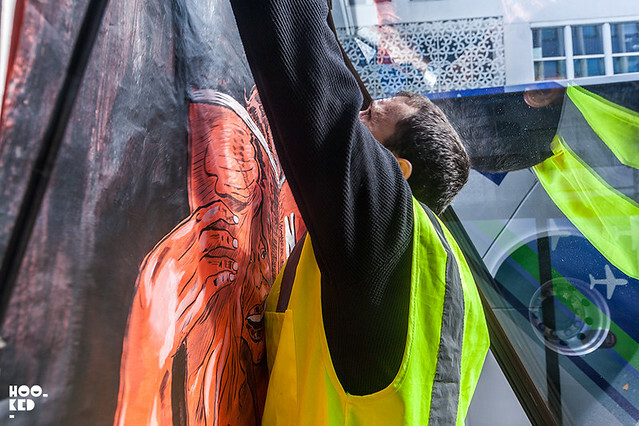 With the hand-printed poster in position, NDA closes the lightbox shut securing the poster in the bus stop ad shell unit. 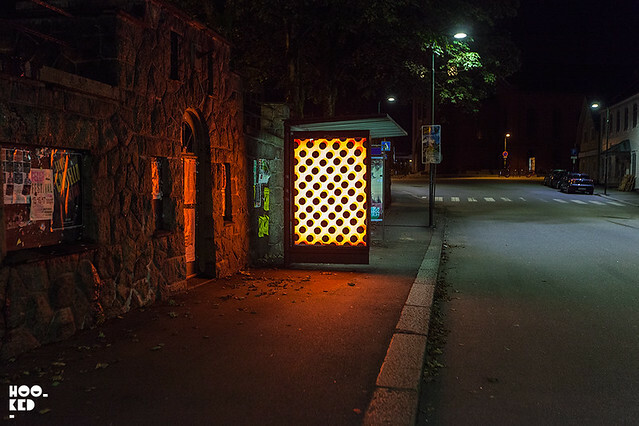 With most of the works installed around various city locations, we hit the pub for a few quick drinks, emerging later that evening to find the piece installed above located across the street from the pub was casting a magical orange glow down the street after the bus shelter light box lights had switched on. 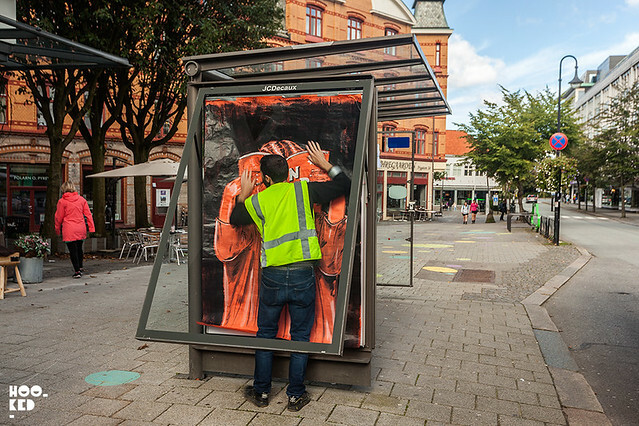 Unfortunately, as with most adbusting work, the installed posters had a short lifespan as the media companies who manage the cities sites often change the advertising on a weekly basis sometimes sooner depending on the site location. 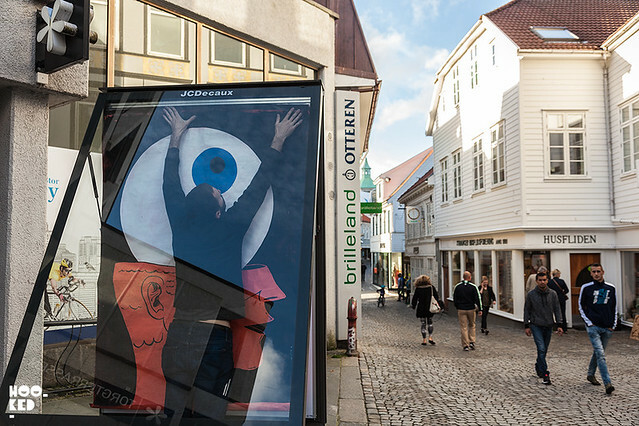 NDA's posters had all been removed and swapped out for new commercial posters by the time we were leaving Stavanger but we were fortunate to see them first hand and be able to join the artist to bring you some images of the work featured here.